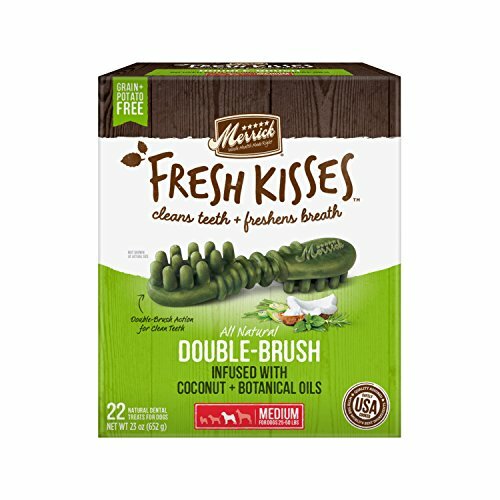 Close cuddles and sweet smooches with your Best Dog Ever just got better with new Merrick Fresh Kisses, an innovative natural dental treat designed not only to clean dog’s teeth, but to freshen breath at the same time. While many dental treats effectively reduce plaque and tartar, until now limited options have been available to also freshen breath. Merrick Fresh Kisses do both. The dental treats feature a double-brush design to clean teeth by removing plaque and tartar during the chewing action of the treat. The treats also are made with natural ingredients specially formulated to freshen breath. Merrick Fresh Kisses are the only dental treat to be both grain-free and potato-free. They are made with all-natural ingredients and, like all Merrick treats, are safely cooked in the USA with no ingredients from China. INGREDIENTS: Pea Starch, Tapioca Starch, Vegetable Glycerin, Gelatin, Natural Flavor, Coconut Oil, Gum Arabic, Fruit Juice Color, Turmeric, Sunflower Oil, Peppermint Oil, Lemongrass Oil, Turmeric Oleoresin, Rosemary Oil. GUARANTEED ANALYSIS: Crude Protein (min) 13.5% Crude Fat (min) 3.0% Crude Fiber (max) 1.5% Moisture (max) 13.0%.